Well, well, well... what do we have here? Why, another batch of D-Arts! And not just any D-Arts: freaking Bass AND Treble. The dynamic duo made their debut earlier today at the Tamashii Nations 2012 exhibition. 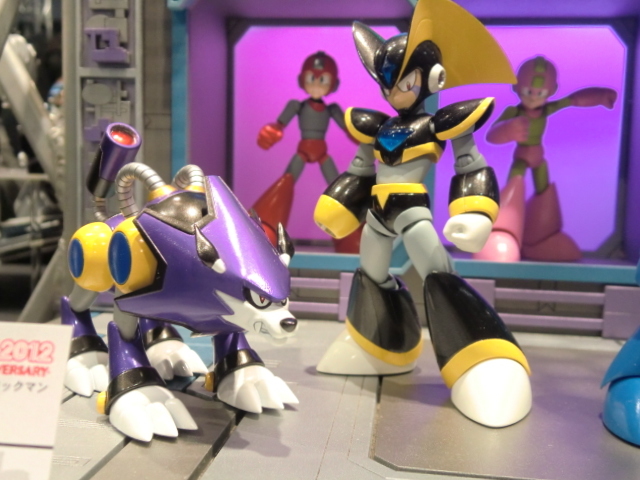 Yeah, the prorotype Ride Armor and Sigma were there, too.... but guys? It's Bass and Treble. Is there anything more to say? No, actually. Details are slim to none at the moment. No price, no release date. I imagine those details will bubble up in no time at all. For more images, head on over to Rockman-Unity and the Charanet Facebook gallery. Thanks to everyone who sent this one in! Pants. I need a new pair of them. I'm just shocked that Treble is there! If I hadn't had to buy a new phone, I would definitely consider buying this. Wow.....I've been able to resist to this point, I think they will have me on these. Bass and the goddamn Treble! Take my money now! Freaking amazing!!! Finally the Bass and Treble figures I always longed for! Looks like Bandai actually listened to the poll. Sigma, Vile and now Bass and Treble who were 3rd in the poll! Now that is a sweet pair of figures. Bass needs a black line on the yellow part of his helment fins, though. I wonder if Treble has any articulation? Now that we have these I how we get both the Super Adapter and Treble Boost! Holy crap! That is friggin' AWESOME! Bad names. Forte and Gospel sounds soooo much better. Nice figures!!! Definitely buying this when it comes out. NOW MAKE BATTLE NETWORK FIGURES. Personally, I'm glad these two were renamed for the English translation. I always thought Forte and Gospel sounded rediculous. Gospel especially. Do want!!! imagine if Treble could turn into the Treble Boost armor for Bass! Super awesome, I hope Bass comes with is a tattered cloak/scarf to go around his neck and a maniacal grinning face. Unless they can combine, I'm not interested. this is the best news ever to grace my mind, but the upper torso on bass looks like it's not on correctly... these are just prototypes though. @kobun37 - The first time I saw Forte & Gospel was in a ROM of Rockman & Forte, so the names have always held a special place for me. I do agree that Bass & Treble are better though. Especially since they go together much better. Although Gospel was a rad name for an evil organization in Mega Man Battle Network 2. Umm... Actually those are the final product, its not a prototype. What you see is how you'll get Bass. lol! "bass and treble" make my ears roll into a tubule, forte and gospel, damnit! Between D-Arts and Kotobukiya, it's nice to see classic MegaMan getting so much quality figure treatment. For too long I've had to suffer 98' Bandai Rockman X recolored kits, NT Warrior action figures and Jazwares' attention to good sculpting but constant penny pinching in the materials department. Japan seems to know how to make a great Megaman figure and it's such a fresh break from the spin-off wannabes. FINALLY! Soo gonna buy this, just need a release date now... soo lemme guess Protoman with Beat next?